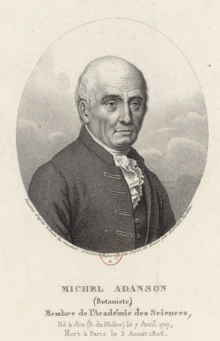 Michel Adanson (1727-04-07 – 1806-08-03), French botanist. Adanson, M. 1763. Familles des Plantes. I. partie. pp i–cccxxv, 1–190. Paris. BHL Reference page. Adanson, M. 1763. Familles des Plantes. II. partie. pp. 1–640. Paris. BHL Reference page. For more multimedia, look at Michel Adanson on Wikimedia Commons. This page was last edited on 24 May 2018, at 17:37.